The scene of the 1974 bombing on South Leinster Street near the center of Dublin. The bombs went off during the Dublin rush-hour, at 5:30 p.m. on Friday, May 17, 1974. 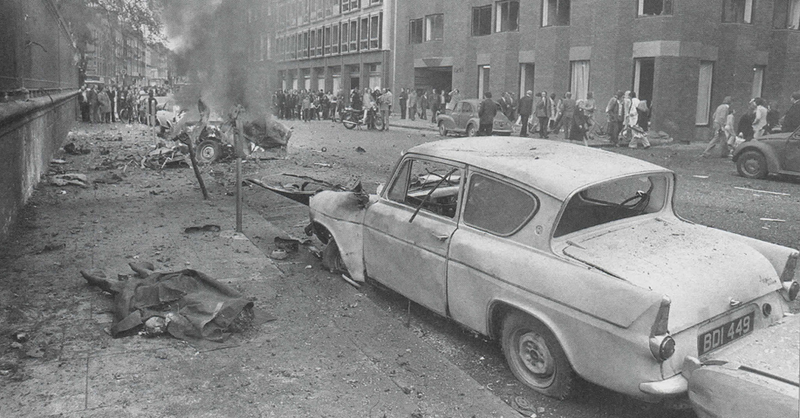 Three car bombs exploded on Parnell Street, Talbot Street and South Leinster Street in the center of Dublin. An hour and a half later another bomb exploded on North Road, in the border town of Monaghan. There had been no warnings. In all, 33 people, including a pregnant woman, were killed and hundreds were injured. It was the greatest loss of life in any one day of The Troubles and the worst atrocity ever committed in the Republic. Yet no one was arrested, charged, or prosecuted. Justice for the Forgotten, the group representing those who died in, and survived, the Dublin and Monaghan bombings, may pursue litigation on the back of the findings of the long-awaited Barron Report. The report, which was published December 10, stated that Ireland’s then Taoiseach Liam Cosgrave showed “little interest” in pursuing the perpetrators of the bombing. Prior to the publication of the report, the group had considered suing the British government. However, upon publication of the report, the scope for blame has widened. Barron blames the Irish government and Garda (police) for not pursuing a full and complete investigation. The investigation was wound down without explanation in early 1975 and Barron said it, “failed to make full use of the information it obtained.” He did not find that there was evidence of collusion between Northern Ireland security authorities and loyalist paramilitaries. But he added that the loyalists responsible for the bombing may have been aided by individual members of the RUC, UDR or the British Army. The group is very critical of the failure of the British government to honor its promise to cooperate with the inquiry. “To the best of our knowledge that help was not forthcoming and delayed the process for at least a year,” she said. Justice for the Forgotten is still hoping that the Barron Report will lead to a full-scale public inquiry. But they will also consider taking legal action in the national courts and at the European Court of Human Rights. A copy of the report will also be given to the Dublin City Coroner Dr. Brian Farrell, who has formally reopened the inquests into the deaths of the 26 people who died in the Dublin bombings. Six of the victims died in the Monaghan bombing and one died some time after the Monaghan bombing. Farrell reopened the Dublin inquests in June 2003, and the Monaghan inquests last month, but adjourned both until all evidence had been gathered. He has asked the Garda commissioner for files on the attacks. Inquests were held in relation to the deaths at the time, but at the request of the Garda, the Dublin inquests were immediately adjourned after the hearing began in 1974. The political response from the Fine Gael-led government at the time was to crack down on Republican paramilitaries. The Garda investigation was halted within three months of the bombings. No explanations were given to the families who felt abandoned by the authorities here.